India’s winning run continues in the Asian Games. 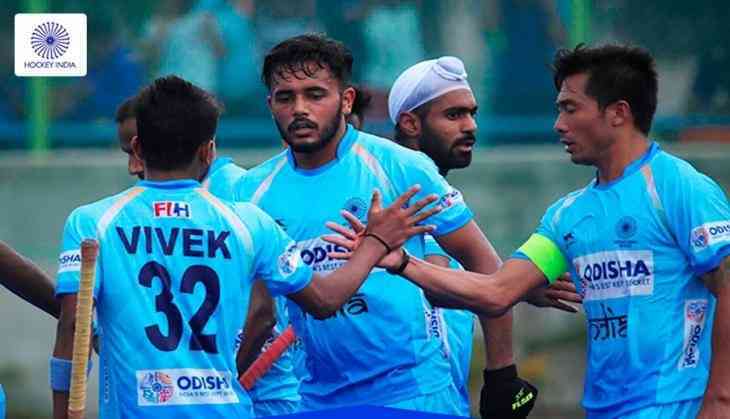 The Indian men's hockey team defeat South Korea at their penultimate pool stage fixture of the Asian Games 2018. India has played challenging game that saw multiple goals scored on both ends of the turf on 26th August. India beat South Korea 5-3 to ensure semi-final berth. This was India's fourth win in a row in the tournament so far and India's spot in the semi- finals with the final tie against Sri Lanka yet to be played. India’s winning run continues in the Asian Games. Four matches, four wins for them.Three penalty corners in a row for South Korea following a good attempt at the goal, earlier, saved by Sreejesh. However, it's Jang Jonghyun, who converts it into the third for Korea off a dragflick towards the right of Sreejesh. Hockey India congratulates the India player Varun Kumar, defender of the Indian Men's Hockey Team, on completing 50 international matches during their fourth pool stage game against South Korea at the Asian Games 2018. 59' GOAL! South Korea cuts down the deficit to 2 goals as they make the best of their set-piece opportunity. Four matches, four wins, 56 goals. The Indian juggernaut rolls on. But this match, for the men in blue was different. This was the first time they faced any sort of challenge and maintain the lead from the starting of the match.